The two sides of the River Wear are currently linked by the Wearmouth Bridge (Built in 1929) and the Queen Alexandra Bridge (Built in 1909). Up until the eighteenth century however, the only way of crossing was by a ferry. This important ferry crossing was protected by Hylton Castle, one of the most historic buildings in the city. Built in around 1450 by a ‘William De Hylton’ the castle stood in its proud position occupied until the early twentieth century. Today all that remains of the castle is ruined shell. 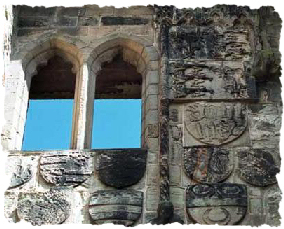 Some notable features still exist however, including the carved coats of arms of various families including the Hyltons, Lumleys, Greys and Washington’s. The Washington coat of arms consists of two bars and three stars and is believed to have been adapted by George Washington for the `stars and stripes’ flag of the United States. 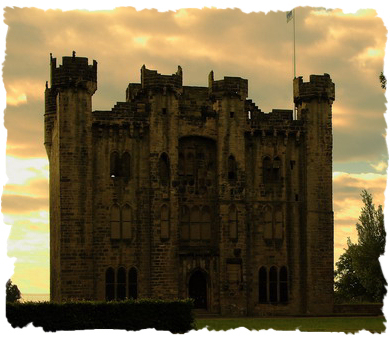 Hylton Castle is however more famous for its ghostly goings on than for anything else! The ‘Cauld Lad o Hylton’, thought to be a stable boy who was slain by Hylton in the sixteenth century was often seen carrying his head under his arm disturbing the servants. The boy had been caught sleeping when he should have been working and Hylton, in a fit of rage launched his pitch fork at the boy. The boy was killed instantly. When the ghost got bored of throwing plates and cups around the kitchen he occasionally popped down to the local ferry where, after impersonating the boatman the ghost would leave all the passengers trapped in the middle of the river!